Rare account of feudal warrior’s daily life. HIKONE, Shiga Prefecture–Fascinating tidbits from the daily lives of samurai warriors have been gleaned from a diary found four years ago at the residence of a notable family. The discovery of the “Biwa Nikki” (Biwa Diary), a memoir of a samurai from the late Edo Period (1603-1867), sent the pulses of researchers racing as few such intimate handwritten documents from that time exist. It had been kept by the Takigai family, which provided matchlock troops for the Hikone domain. Researchers at the Hikone Castle Museum and a study group have been scrutinizing the work that records the reminiscences of the family’s seventh-generation Uhachiro (1843-1923), one of the last warriors of the domain. The document was written in 1912 by Tatsugoro, the fifth son of Uhachiro, based on stories he heard from his father. Researchers have completed their studies of the diary in the portion up to the early Meiji Era (1868-1912). The notebook includes a description of Uhachiro participating in “sankin kotai,” or alternate attendance, whereby feudal lords and their retinues were required to repeatedly relocate to Tokyo as a way of ensuring loyalty to the shogunate. There is also a description of Osaka’s Tenpozan battery guard. Uhachiro also told his son about how he once fell asleep during a forced march. In another episode, about the battle of Toba-Fushimi in 1868, the diary notes that Hikone warriors were not involved. They were quartered in Kyoto at the time, and provided with rice balls that were so large that Uhachiro was able to preserve quite a bit and take it home as a souvenir. The Tokugawa government army was defeated by the Choshu domain army in the second Choshu War in 1865, which claimed the lives of Hikone warriors. Uhachiro heard from Hiroshima merchants about Spartan nature of the Choshu domain warriors. The Hikone domain later remodeled its army system and adopted up-to-date Western-style weaponry. 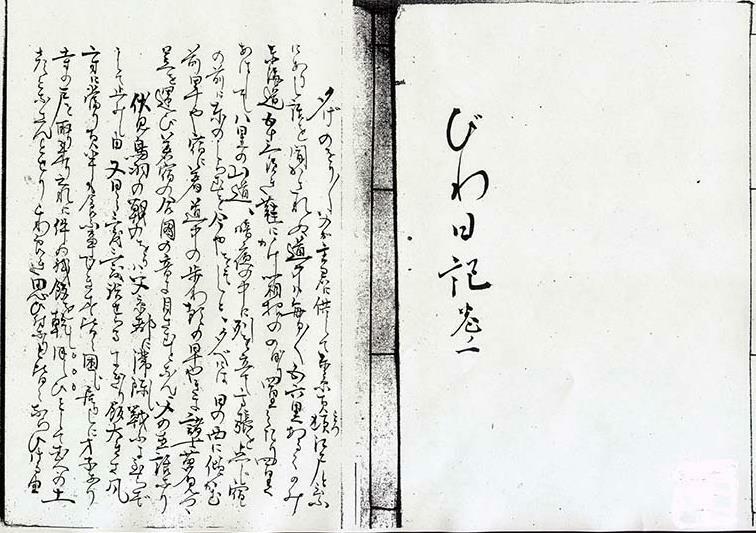 Another document written by Uhachiro himself and kept by the Takigai family shows that he visited Nagasaki to purchase muskets. The Takigai home, built in the late Edo Period, was designated the city’s cultural property in 2011. Among its treasures are a number of matchlocks, spherical bullets and a notebook on daily drills at the firing range where 500 bullets were used. These items have been on display at a museum here since last October. A lecture on Biwa Nikki is slated in early October. Absolutely, I would be quite content to read, or try to read, as many historic Japanese primary source materials as I can for the rest of my life. Thankyou. I love your site too. I hope we can continue to share information. Previous Post Hikone Castle – Shiga Prefecture. My photos and Meiji Period photos.